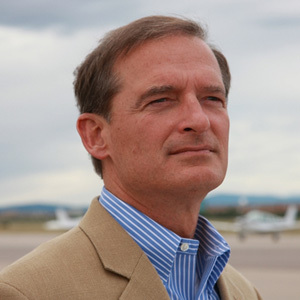 George Bye is the Founder and CEO of Bye Aerospace headquartered in Centennial Airport in Englewood, Colorado. Follow them on LinkedIn and learn more at ByeAerospace.com. Bye Aerospace develops electric and solar-electric aircraft, ranging from small unmanned aerial systems and general aviation aircraft to large, medium-altitude, long-endurance unmanned aerial vehicles. The company expects to achieve certification from the Federal Aviation Administration (FAA) and begin production of its 2-seat “Sun Flyer 2” all-electric flight training aircraft in 2020. We bring advances in energy and design efficiencies to the general aviation market because there is a sizable demand for new, quiet, efficient flight trainers due to the commercial pilot shortage. From 1959 to 1998, more than 236,000 single-engine airplanes (typically used for flight training) were produced, according to the General Aviation Manufacturing Association. The average existing fleet of these aircraft now exceed 45 years and use the only leaded fuel still allowed to be produced. Bye Aerospace’s electric Sun Flyer offers a significantly reduced hourly operating cost, plus the added benefit of no carbon dioxide emissions and substantially reduced noise signature. Bye Aerospace aims to be the first company in the world to achieve FAA certification on an all-electric airplane. Thanks to the benefits of low operating costs, the benefits of electric flight will begin to help address the pilot shortage resulting from increased global demand. In July 2018, Boeing announced that 790,000 additional business and airline pilots are needed globally over the next 20 years. We consistently strategize and refine our human and financial growth capital needs. An early prototype for our Sun Flyer 2 airplane had its first flight in April 2018, and we have an ambitious yet achievable certification plan in place. Patience. Bye Aerospace was founded in April 2007, and within 18 months, the economic recession was in full swing. We generated revenue by outsourcing our services to other companies as we continued to wait for our industry to not only recover, but embrace, the benefits of electric and solar-electric powered flight. Identify a specific passion that makes you feel challenged AND fulfilled—something you could never get tired of exploring and learning more about. Then do your homework to determine the holes or opportunities not being pursued. Seek to be the first AND the best. Join the throngs of aviation enthusiasts who are excited about the possibilities for our future!